University of Washington women’s crew went into the weekend ranked behind both The Ohio State University and the University of Michigan, but defeated both Division I rivals at the Pac-12 Challenge and jumped to the top of the second regular season USRowing/Collegiate Rowing Coaches Association Division I, II and III Collegiate Rowing Polls, presented by Pocock Racing Shells. The Huskies of Washington swept all eight events entered to earn their first place spot in this week’s poll with 24 of the 25 first-place votes. In second place was the University of California, Berkeley falling one place with one first-place vote. The University of Michigan maintained their previous ranking at third place. Rounding out the top five were the Ohio State University in fourth place and the University of Texas in fifth place. In the Division II poll, Florida Institute of Technology (three first-place votes) joined last week’s first place-holder, Western Washington University (two first-place votes), to tie for first place. Competing on opposite coasts at the Florida Intercollegiate Rowing Association Championships and the San Diego Crew Classic, both Florida and Western Washington had a strong showing bringing home medals in each event entered. Following close behind in the DII poll was University of Central Oklahoma in the third place position. Humboldt State and Nova Southeastern University completed the top five. Another tie topped the Division III poll with Wesleyan University and Bates College both matched for first place. 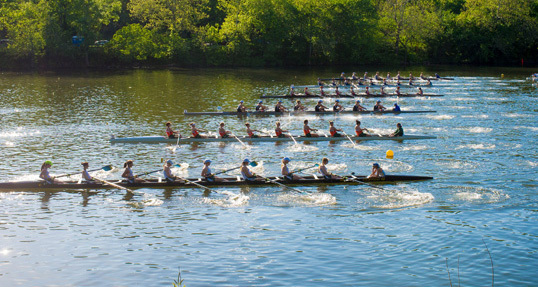 Williams College was third, with Wellesley College and Ithaca College in fourth and fifth place respectively.